Regardless of the destination, you can count on Overseas Container Forwarding to deliver on time and on budget. It’s a promise we can make because our reach is global. While we are a Canadian company headquartered in Vancouver, our agreements are with reliable, carefully selected, worldwide partners. These partnerships are nurtured with regular face-to-face meetings both at home and abroad. Should a problem develop a single phone call to an associate overseas can make a world of difference. We understand it would be impossible for us to have satisfied customers without satisfied vendors. We place great importance in building and maintaining excellent relationships with our ocean carriers. Overseas Container Forwarding Inc. has served our shipping clients since 1979 managing an annual volume in excess of 35,000 containers. Our staff can serve you in English, Mandarin, Cantonese and other languages as required. Our many years of specialized experience and our solid reputation in the industry attract top global partners. What that means to you is excellent service, competitive pricing and the highest level of customer satisfaction. 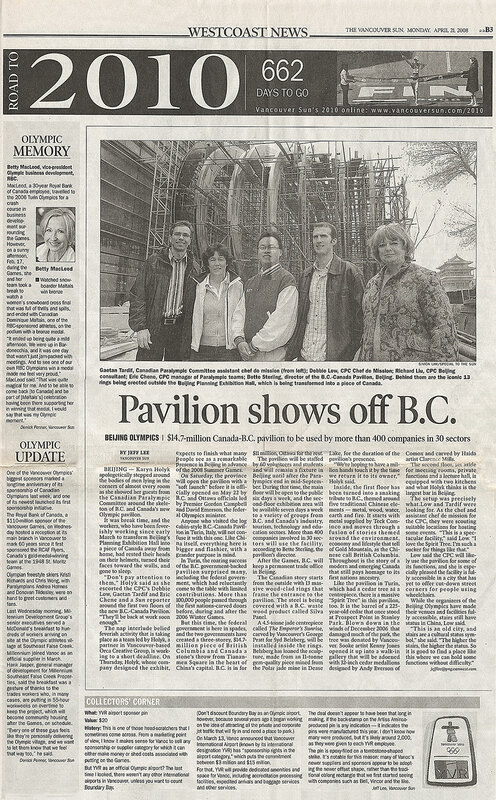 In 2010 OCF was involved in a $14.7 million Canada-B.C Pavilion project for the Beijing Olympics that spanned more than 400 companies in 30 sectors. A large shipment of oilfield fracturing equipment, manufactured by Dyer Equipment Inc. of Calgary, was recently shipped through the Port of Vancouver to the Port of Xingang in the People's Republic of China. The cargo consisted of 12 pumper trucks, two blender trucks, two monitoring vans and 70 cases of spare parts and accessories. The equipment is to be used to increase oil-well productivity by pumping a mixture of water and sand under extreme pressure into oil wells, causing rock fracturing and a faster release of oil and gas deposits. The $8 million shipment was handled — and all transportation arrangements made—by Overseas Container Forwarding Inc. of Vancouver. 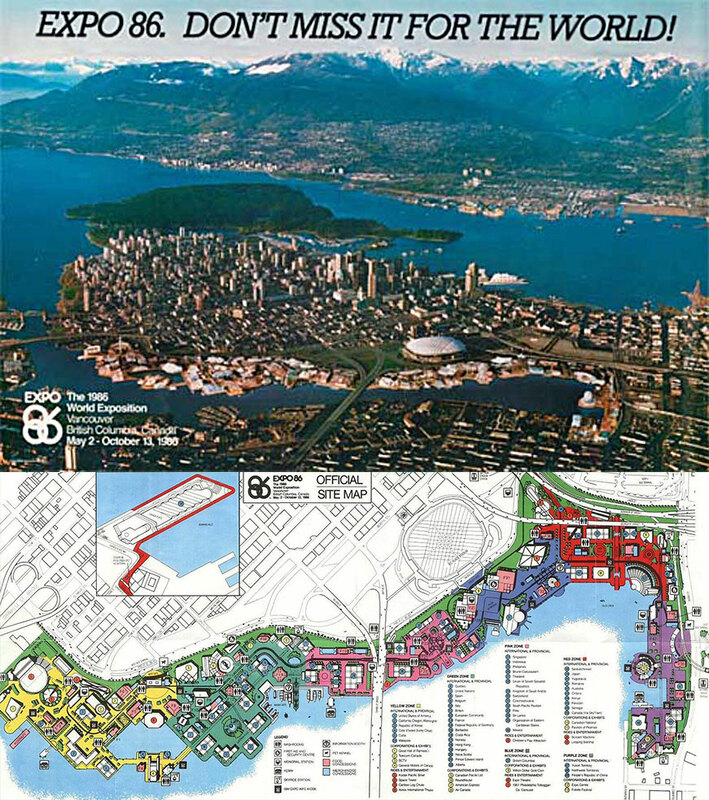 In 1985 OCF organized the logistics for an 8 million dollar project from Canada to China. 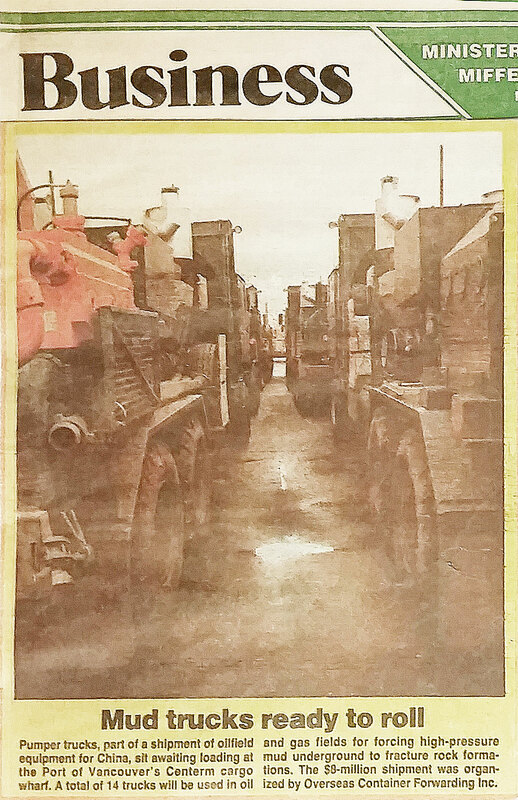 Pumper trucks, part of a shipment of oilfield equipment for China, sit waiting, loading at the Port of Vancouver's Cenferm cargo wharf. total of 14 trucks will be used in oil and gas fields for forcing high-pressure mud underground to fracture rock formations, The $9-million shipment was organized by Overseas Container Forwarding Inc.
At Expo 86 OCF handled the logistics for several Pavilions, including France, Romania and Sri-lanka. Overseas Container Forwarding has been providing our customers with uncompromising service since we began in 1979. 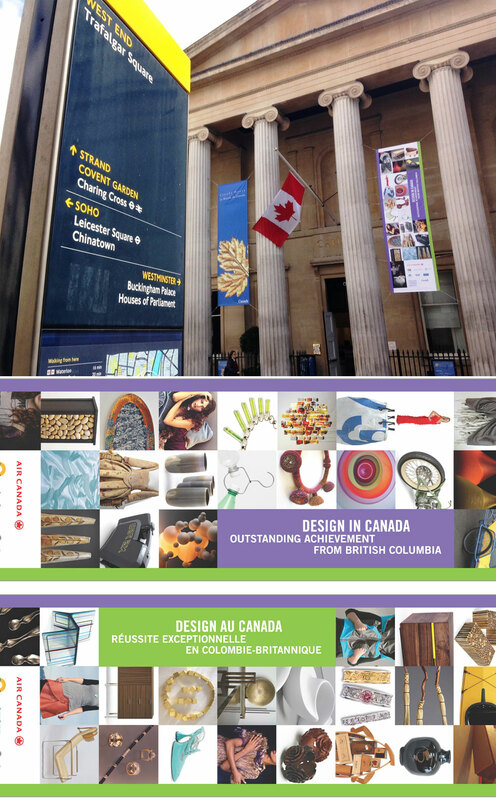 In our early years we concentrated on FCL export from Western Canada and the US Pacific Northwest. We commenced our perishable program in 1982 with products such as frozen fish, frozen French fries, and frozen apple turnovers to a well-known American fast food chain. Our first consolidation service began in 1983 to Continental Europe and the Mediterranean. 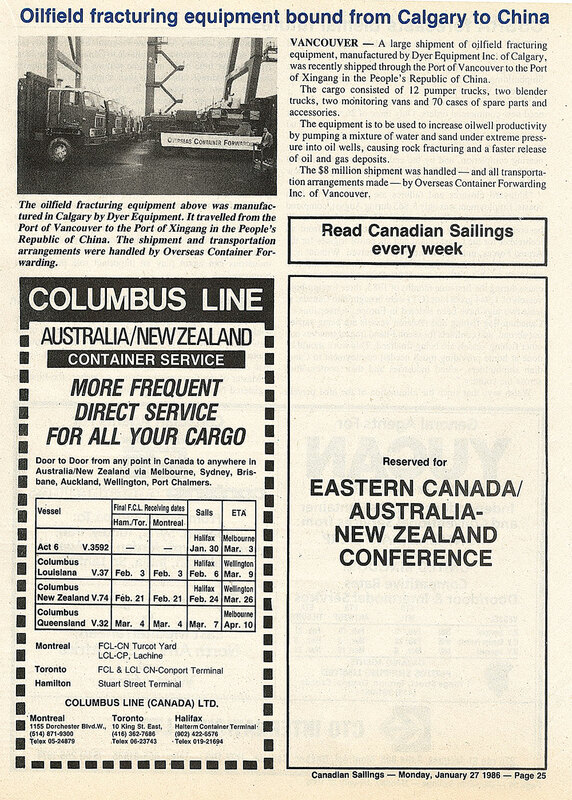 In 1985 we added export consolidation services to the Far East. Subsequently we began developing our import consolidation services. What we have today is a very solid foundation in multiple trades, and we focus on continual improvement of client care and customer service. In 2017 Overseas Container Forwarding Inc. (OCF) teamed up with Habitat for Humanity Canada on a two year charitable partnership, working to tackle the global affordable housing crisis in countries less privileged than our own. As OCF operates on an international basis, we decided it was time to take action and help support families and communities in less fortunate parts of the world. OCF donated $5 to Habitat’s Global Neighbours Program for each and every less-than-container load (LCL) consignment that we handled between January 1st, 2017 and December 31st, 2018 with a commitment to a minimum donation of $100,000. We also sponsored a Habitat Global Village Trip to Vietnam for one of the communities that the Global Neighbors Program support.